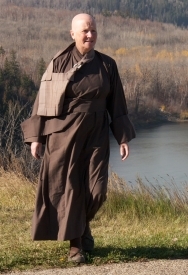 Are you a Buddhist Nun? Then. Yes, yes I am! And left me still sitting down. Then I bought the Ricola’s. For the woman and her friend. I hope you find what you are looking for. I did! I like these moments when people are open and asking. Sometimes it happens in the most unexpected places. At the gym yesterday I could overhear two others talking about religion. One of them is a nice guy I’ve seen for a long time at the gym. His name is Apae from Turkey and he was talking to another guy from the Middle East. Apae told the guy that I was Buddhist and then they both started asking questions. Not so easy to reply while doing sit-ups! :0) It was a nice moment to see how they opened their hearts to talk about how they are seeking the Truth and I could open mine. These bright moments are so wonderful, moments of sharing and opening and you never know where! A gift. This post fills my heart with joy. I hope the person suffering the cold recovers(ed) quickly!